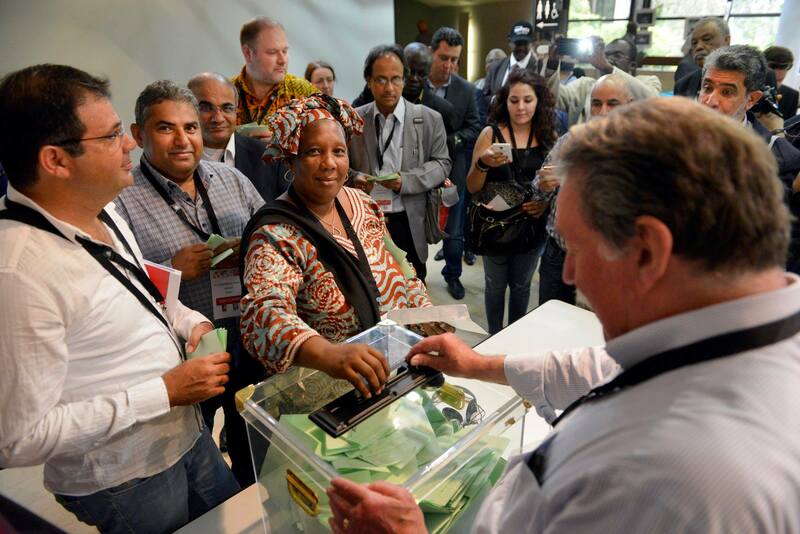 More than 300 delegates representing more than 450,000 journalists in 140 countries gathered in Angers, France for the 29th International Federation of Journalists World Congress, June 7-10. It was the 90th anniversary of the founding of IFJ. There were many panels, debates and discussions about the safety of journalists, defending and extending press freedom, increasing surveillance, access to information, ethics, copyright, rights at work and gender equality. Special attention was paid to recruiting, organizing and servicing young journalists. Philippe Leruth, a member of the Belgian Association générale des Journalistes Professionnels de Belgique (AGJPB) was elected President. Younes M’Jahed of the Moroccan Union, who spent 10 years in a Moroccan prison, was elected Senior Vice-President, and outgoing President Jim Boumelha (NUJ UK and Ireland) was elected Honorary Treasurer. A new Executive Committee was also elected, which included delegates from Palestine, Peru, Somalia, Panama, Canada, Russia, Taiwan and more. The delegates voted on a number of constitutional amendments, including securing the Gender Council in the constitution, and 16 Urgent Resolutions. There was a special commemorative march for the murdered journalist Camille Lepage, who was from Angers and was killed in the Central African Republic in 2014. NWU’s attendance resulted in stronger connections and a bigger to-do list. We are reaching out to other affiliate unions to help build the pay rate database at WhoPaysWriters, and investigating the possibility of an international organizing campaign at a major digital publisher that would organize staff writers and set a negotiated pay rate for freelancers. We will also be playing a more active role, representing IFJ with UNESCO at the UN in NYC. It was a special treat to see “old friends” I first met at the Dublin Congress and have kept up with since, from UK, Pakistan, Ireland, Malaysia, India, France, Russia and Somalia, and to meet new friends, from Canada, Palestine, Peru, and the Dominican Republic. And it was very special to be able to participate in the massive demonstration against the new labor laws in France, with our colleagues in the SNJ-CGT journalists union.